I've been obsessed with maxi skirts lately (high slit one's gonna be the next hotness), and I received this lovely high slit maxi skirt from She Inside. Go check their webstore for more rad stuffs! Speaking of shopping, Brightspot Market is happening now until Sunday 10 June, you better don't miss it. Visit AYE Denim booth there because they're exclusively launching their new collections of dry denims & t-shirts (yes you can find this T-shirt I'm wearing there) and not available online yet until Brightspot's over), make sure you'll be the first to have it! That hight slit maxy skirt looks great on you! too great <3 keren abis cee! love all things that you wore! super pretty and cute puppy! I want your skirt, and your slim waist! 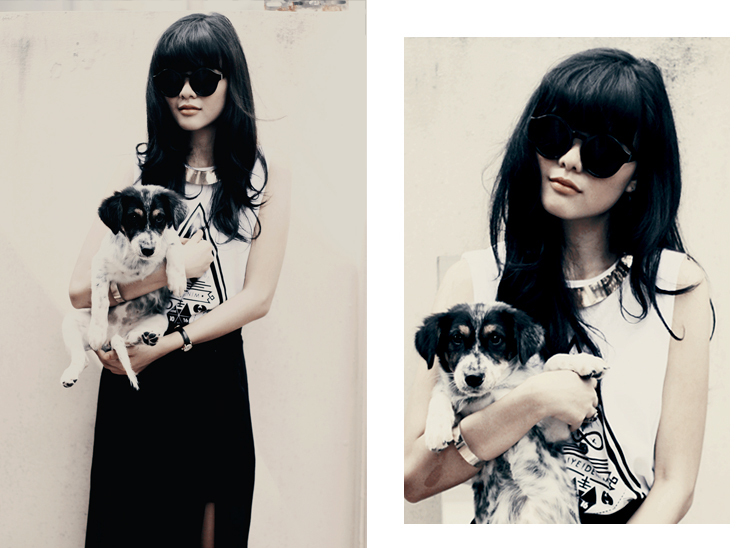 this is my fav style..
blog nya mantapp abis sist ..